The Schatten RB-2 Rockabilly (passive) pickup includes the RB bridge sensor, black jack assembly and adds a second sensor to the underside of the fingerboard for that Rock-A-Billy string slap. Included with the RB-2 is a pair of integrated thumbwheel volume controls that mount to the underside of the fingerboard, allowing for convenient pickup balance and volume adjustment. 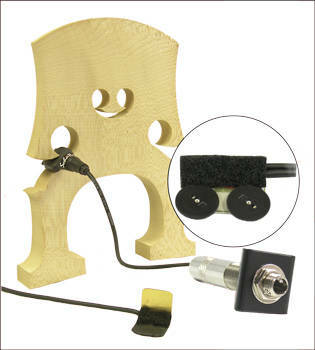 Main Sensor: The RB sensor element is designed to fit in the wing slot of a bass bridge. Normal placement of the sensor is in the bass side slot. The sensor has a nominal thickness of 0.25" (6.35mm) and requires a slot opening of approximately 0.225" (5.7). The fit of the sensor in the slot is meant to be snug and there is intended to be a slight interference fit. The sensor will compress slightly as it is pushed into the wing slot. Black Jack Assembly: Provided with the passive systems, the black jack assembly simply clips between the D and A strings just above the tailpiece. The output jack itself is a standard 1/4". Extra Slap Sensor: Designed for Rock-A-Billy, the Extra Slap Sensor is provided with the RB-2 (passive) and RB-2A systems. This extra pickup installs to the underside of the Bass fingerboard with 3M VHB foam tape. Volume Controls: The RB-2 comes with thumbwheel volume controls. These RB-2 units install to the underside of the fingerboard with 3M VHB foam tape.